The other day we were at a local sports bar with our significant other. 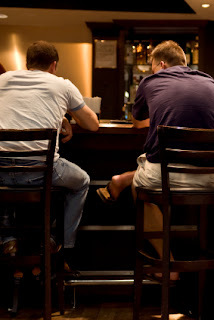 We were seated at the bar, and couldn’t help but notice that there was a long line of guys spread out down the bar, all avidly watching football on the five jumbo screens in front of them. Once JSG realized the Patriots were going to crush yet another team, our eyes started to wander. We spotted a table of two adorable 20-something women seated right in the middle of the room. Given that the odds were about 50:3 men to women you would think they would have their pick of the litter. Not so. Despite the fact that they were very cute and obviously available, not one guy talked to them for the entire four hours we were there! What gives? Our own scrumptious boyfriend, put it this way: When guys are watching sports, first comes the game, second is beer, third is the chicken wings, women rank a distant fourth. Making matter worse, according to honey, after the game guys are too drunk and full to think about women. So head to the sports bar to watch the big game (Hail to the Redskins! Go Yanks!) but know you won’t be going home a winner in the game of love.